When Brian Menard began his academic career at Florida State University, he was not expecting more than the routine of attending classes until he started studying attention deficit hyperactivity disorder. Menard, a junior from North Port, Fla., began college as a clinical psychology major, which lead to his first research project at the Children’s Learning Clinic. “I looked at working memory, which is a measure of cognitive ability that looks at not just information we hold short-term, but information that we can hold and manipulate to complete cognitive tasks,” Menard said. Menard compared this kind of memory to IQ to see which one correlated more with outside factors, such as socioeconomic status. This would eventually reveal which has a bigger effect on children’s performances in reading and math in school. The lab Menard worked in performs these studies to discover potential treatments outside of the standard medications and therapy in hopes of having more long-term relief. “If we introduce an alternative measure that can both improve the current abilities children with ADHD do have and make them more successful, then that’s what we’ll do because it’ll be long-term treatment,” Menard said. Menard worked on this project alongside Michael Kofler, an assistant professor of clinical psychology at FSU. 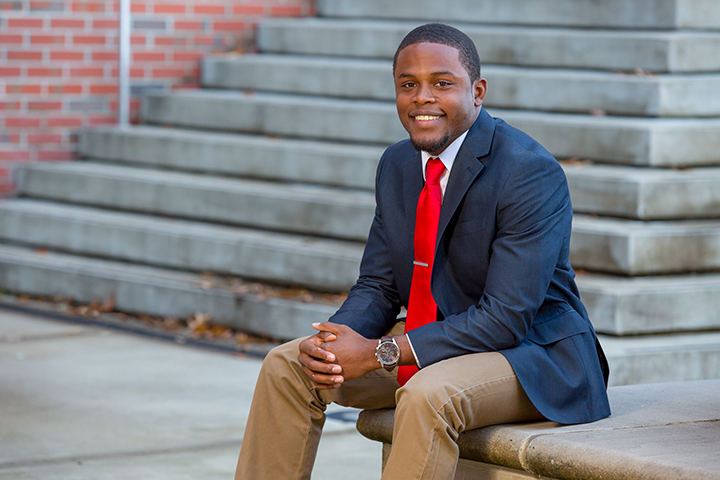 Once Menard became more involved on campus, his passions and career plans shifted. His long list of community service projects lead him to aspire to one day help other students discover the depth of their collegiate community. Menard was a facilitator in the Service Leadership Seminar, a weeklong event for incoming freshman who wish to learn more about community service, identity and leadership. Menard distinctly remembers his group of young students in awe over a new gender-neutral bathroom, and feeling a sense of pride when they appreciated that a simple facility could help the life of some of students on campus. “That captured the entire focus of the week, that we need to make this university feel like home for everybody,” he said. In addition to his time spent at the Service Leadership Seminar, Menard also serves as the director of public relations for RENEW, Realizing Everyone’s Need for Emotional Wellness. Menard recognizes that college students can face enormous pressure. RENEW helps them build the skills needed to thrive in college. “We do a lot of outreach and presentations for students who struggle with time management and study skills to help improve student wellness on campus,” he said. The group also encourages taking the time to relax and think about mental wellness in addition to grades and GPA. Menard recently accepted a grant from the Center for Leadership and Social Change as a part of the Moellership Program. The grants allow students to spend their summer working with nonprofit agencies. Menard has spent the past year working with Camp Boggy Creek, which allows chronically ill children to spend their summer having fun away from hospitals free of charge. “These kids can spend a week from home and be a child again and just have fun,” Menard said. Menard wanted to expand his service with the camps by traveling to others around the country and abroad to volunteer, and he was awarded the grant to make the journey possible. After graduation, Menard plans to get both his master’s and doctoral degrees in order to return to a university and work as a higher education professional. He hopes to continue to work in student affairs to build the leadership skills and college experiences for the next generation of college students.